When Batman Begins came out, Mattel sold small, crappy figures. When The Dark Knight came out, Mattel sold Movie Masters, and small, crappy figures. And now that Dark Knight Rises is out, Mattel is selling Movie Masters and the smallest, crappiest figures you've ever seen! When Commissioner Gordon stumbles upon a plot to destroy the city from within, Bruce Wayne gets back into action as the Batman. Waiting for him is Bane, a lethal adversary on a crusade to tear apart Batman's legacy piece by piece. Clearly the idea was to offer a low-cost alternative to expensive, highly articulated figures, but in order to hit their target pricepoint, Mattel bottomed out, hard. They're small, they're unpainted, and frankly, they look like the kind of toys your well-meaning aunt would buy at the drug store. There's a reason we haven't reviewed any of the things. Until now. While trying in vain to find Candy Corn Oreos, I wandered into Target's seasonal section - you know, the back corner of the store where they have all the Halloween junk. They always have a few exclusive Halloween toys, but they're usually pretty uninteresting. This Batman, however, really catches the eye. The packaging for the rest of these Movie non-Masters is dull and uninspired, all done with the same generic graphic design that looks like the work of someone with at least an hour of desktop publishing experience. This exclusive spices things up at least a little bit, putting the figure in an orange tray designed to complement the pumpkin-shaped blister. There are even a few Batman-themed jack o'lanterns on the name tag at the bottom, which is neat. 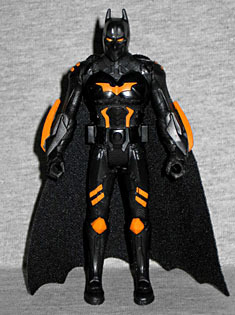 The appeal of this figure is his paint job: he's black with orange trim. Not only is that a great combo for Halloween, it's also about the most "Batman" color scheme any of these dinky little figures have. 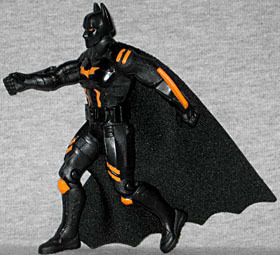 This actually wouldn't look too bad on a real Batman toy - okay, maybe just on one from that new, slightly cartoonish "evergreen" line, but still. Suprisingly, the sculpt on Halloween Batman isn't too shabby. Yes, the figure only stands 4⅛" tall, but he has distinct armored plates with identifiable straps and a specific texture on the undersuit. Instead of the usual little hooks he has a single, large blade on each arm, and his mouth is completely covered by his mask. His utility belt appears to be a series of individual pouches that just magically float around his waist - there's nothing connecting them to each other. 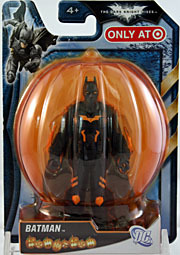 This same mold was previously seen as "Stealth Batman" in Target's exclusive five-pack: you know, the one dumbdumbs thought was a secret spoiler for Dark Knight Rises. The articulation is garbage by any standard. 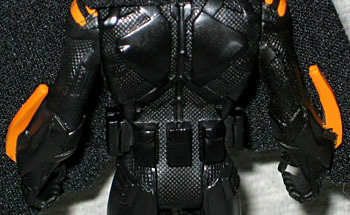 All Hallows' Batman has a swivel neck, swivel shoulders, T-crotch and hinged knees. And also, now is a great time to check how much time is left on your AOL Free Trial disc, because apparently this is 1997, if we're supposed to believe the world's second-largest toy company designed, approved, and released this thing and seriously thought it was good enough to be seen in public. This figure only cost $5, which, yes, is less than 4" toys from Hasbro cost, but there's a reason for that: he's cheap because he's cheap. This is definitely a toy for all those small kids who went to see the violent PG-13 movie about nuclear terrorism. But he's intended to be a giveaway for trick-or-treaters, right? Who's the freaking Moneybags who's spending $5 per kid, plus candy? Even I find that a ridiculous expectation, and my Halloween looks like this. Halloween Batman makes a fun little display piece for the season, but he's a bad toy.